There are two smashing new photos on the photo page. Click here to head right there. (31) Central London – With the Rock And Roll Circus project slowly gaining momentum, Keith headed back into London to meet old friend Alan G. Parker and one of the top literary agents, KT Forster. (30) South London – Our Mr Badman spent an enjoyable afternoon, discussing future projects, with old mucker, Tel Rawlings. (29) Leafy Berkshire – Another meeting in Windsor with the legendary 60s/70s photographer, Mike Randolph. Top of the agenda, their Rock And Roll Circus photographs project. (27) Leafy Berkshire – Its came around fast, but today was Record Collector deadline day. Under the archival microscope this time; Ringo Starr’s March 1973 appearance, to promote That’ll Be The Day, on LWT’s then top-rated Saturday night chat show, Russell Harty Plus. (22) Leafy Berkshire – A rather busy day when, to begin with, Keith paid his first visit to the palatial Berkshire home of legendary, 1970s ground-breaking builder, Max “Superhod” Quarterman and his lovely wife, Eileen. “Thanks to you both for your wonderful hospitality,” after which, following a visit to his dear, dear Mum, Keith caught-up with another old mate, and rather good bass player, Daniel J. Wall. (20) At last! The first public viewing of the forthcoming David Essex Movie was seen when a trailer of it was uploaded onto Youtube. - Canada – Interesting news today when, on Amazon Canada, the kindle and paperback versions of Marilyn was seen at #s 3 and 5 respectively in the “Most Wished For in Monroe, Marilyn” section of the site. (13) Canada – Staggering to say the least. 2 Top Ten placings on the same day on Amazon Canada; in the “Best Sellers in Monroe, Marilyn” chart, the hardback version raced back up to the #2 slot, while the softback version was seen in the #6 position. -The latest issue of Record Collector, featuring Keith’s tribute to the singer, Errol Brown, crashed thru the letter-boxes of subscribers around the UK today. (9) Canada – Paperback #2, hardback #10 in Amazon Canada’s “Best Sellers in Monroe, Marilyn” listing today. (5) Ireland – Family matters and logistical problems meant Keith was unable to appear live as a guest this evening of Simon Tierney on his Newstalk Radio show, in Dublin, Ireland. The topic of conversation was to be the UK release of the new Brian Wilson bio-pic movie, Love And Mercy. (6) Canada – The hardcover version of Keith’s Marilyn suddenly leapt back up to the #3 position in the “Biographies & Memoirs > People, A-Z > ( M ) > Monroe, Marilyn” section on Amazon Canada and (“can you believe this”) just two places behind Norman Mailer’s legendary, ground-breaking, 1973 biography on the actress. (4) Leafy Berkshire – A return visit to Barratt’s Bistro in Sunny Slough; one of the finest eateries in Slough. (3) Central / outer London – With plans to turn his Marilyn book into a visual format, Keith eagerly attended an early-morning meeting with several, high-profile notables from the media industry. “Most exciting times indeed,” he beamed afterwards. - After which, Keith headed-off to Wandsworth, South West London to meet-up with director, Alan G. Parker for discussions about the still unreleased KISS and David Essex movie productions. (29/30) Leafy Berkshire – Record Collector deadline day loomed large again when Keith penned / compiled a piece on Monkee, Davy Jones’s rarely-covered June 11 1968 trip to Manchester’s former Belle Vue Zoo & Gardens to leave his mark in their (short-lived) ‘Walk of Fame’. - Canada – A rush in sales meant that the softback version of Marilyn climbed back up to the #2 position in the “Biographies & Memoirs > People, A-Z > ( M ) > Monroe, Marilyn” section of Amazon Canada. While on the same day, on the same site, the paperback version was also spotted at #10 in the “Most Gifted in Monroe, Marilyn” listings. (23) Canada – On Amazon Canada today, in the “Biographies & Memoirs > People, A-Z > ( M ) > Monroe, Marilyn” section of the site, the hardback version of Marilyn was spotted at #21 and the softback at #35 It didn’t end. In the “Most Gifted” in Marilyn section, on the very same day, the softback version was placed at #9 while the hardback was at #16. (18) America – Well, here are some fascinating statistics, found today on Amazon.com. Keith’s Marilyn was spotted at #5122 in the “Biographies & Memoirs > Arts & Literature > Actors & Entertainers” section, at #5290 in the “Humor & Entertainment > Movies > Biographies” and at #6457 in the “Biographies & Memoirs > Specific Groups > Women” listings. (16) America – Thanks to “Rebecca Cruzon” for her four-star review on Marilyn on Amazon.com. “Very interesting and down to earth,” she wrote. (09) Italy – The Kindle version of Keith’s Marilyn, Gli ultimi giorni di Marilyn Monroe: Le relazioni pericolose, le trappole, il presunto suicidio: tutta la verità sulla fine, was spotted at n.22 in the “eBook Kindle > Arte, cinema e fotografia > Cinema e television” section of Amazon Italy. (6) Leafy Berkshire - A most welcome, return visit to the fine diner, Barratt’s Bistro. "Top food, delightful conversation... what more can you ask for?" (4) South East London – Keith travelled to the Westminster Live Studios, on the Albert Embankment to tape an interview for the new Beatles documentary, which is being produced by Alan Byron for Odeon Entertainment. (1/3) Leafy Berkshire – Mr Badman penned / compiled his latest Record Collector article; a tribute to the late, great, sadly missed Hot Chocolate singer, Errol Brown. (26) London – Logistical problems meant that Keith was unable to accept (from producer, Lucia Walker) an invitation to appear on today’s ITN News bulletin to talk about the eight photos taken of Marilyn Monroe by her friend, George Barris approximately 3 weeks before she tragically died. (23) Leafy Berkshire – Aside from house renovations, our Mr. Badman spent the day doing more research on the forthcoming, new Beatles documentary. - On the IMDB, Keith stood at No.25 in the “Most Popular People Born In Slough/ England/ UK” listing on the site. (20) Leafy Berkshire – Another almighty catch-up with long-time friend, Daniel J. 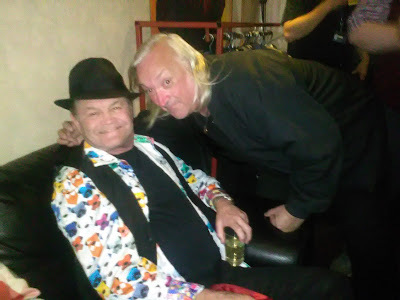 (19) Leafy Berkshire – Further work on Cash’s project plus lengthy discussions with the “Geezer & A Blonde” proprietors, Alan G and Alexa M. “Yes, folks, the KISS movie project is finally underway again,” our Mr Badman announced afterwards. (18) Leafy Berkshire –Further business-related discussions with Dave Cash. Keith also prepared / outlined his video show for this year’s Beatles Convention in Liverpool. (16/23) BBC Four – The award-nominated, four-year old, 2-part documentary, Queen: Days of Our Lives was repeated on this channel. (11) Canada – For two straight weeks now, Keith’s Marilyn stood at #1 in the “Most Gifted in Monroe, Marilyn” section on Amazon Canada. While in the “Biographies & Memoirs > People, A-Z > (M) > Monroe, Marilyn” section of the site, the December 2013, softback, re-print edition resided at the #18 position. -Leafy Berkshire – Keith had a most enjoyable conversation with Status Quo’s songwriter/ collaborator and long-time close friend, Bob Young. A rather interesting new project was discussed. More news soon! (9) Canada – You’ll never believe this but it was still there. For 12-straight days, Marilyn was still in the #1 position in the “Most Gifted in Monroe, Marilyn” section on Amazon Canada. (6/7) Leafy Berkshire – Certainly comes round fast…it’s that time again, and Record Collector magazine came a'knocking for another piece. This month, Peter Gabriel’s never repeated 1982 appearance on ITV / LWT’s The South Bank Show. (4) Canada – Bank Holiday Monday saw Marilyn STILL in the top slot of the “Most Gifted In Monroe, Marilyn” section of Amazon Canada. "Been there for a week, ya know…Happy Holiday!" (1) Canada – What a splendid start to the month. A quick peruse of the Amazon Canada book charts see Keith’s Marilyn STILL in the #1 position in the “Most Gifted in Monroe, Marilyn” section. “Onwards and upwards,” said Keith. (30) Canada – Incredible to say the least. Two days on and the paperback edition of Marilyn was still in the #1 position in the “Most Gifted in Monroe, Marilyn” section on Amazon Canada. -Meanwhile on the IMDB, Keith could be found in the No.25 position in the “Most Popular People Born In Slough/ England/ UK” listing. (28) Canada – Still on the move! In the Amazon “Bestsellers in Marilyn” rankings on Amazon Canada, the softback edition of Keith’s Marilyn suddenly climbed back to the #1 position; yes Number One in the “Most Gifted in Marilyn” section. The great news didn’t end there. Also today, the book was seen at #4 in the “Biographies & Memoirs > People, A-Z > ( M ) > Monroe, Marilyn” and #58 in the “Humour & Entertainment > Movies > Biographies” listings. (23) Canada – Get this! Get this! The paperback edition of Marilyn had completely out-of-stock on Amazon Canada. Impressive sales meant that, in their Bestsellers Rank, it had risen, quite healthily to #6 in their “Books > Biographies & Memoirs > People, A-Z > ( M ) > Monroe, Marilyn” and to #30 in their “Books > Humour & Entertainment > Movies > Biographies” listings on their site. -Leafy Berkshire – A brief part of the day was spent engaged in more research work on the new, Dave Cash project. (17) IMDB – Keith was at No.24 in the “Most Popular People Born In Slough/ England/ UK” listing on the world famous, IMDB website. -“Never stops here, ya know.” Further time was spent working on the decorative angle of Chez Badman. (15/16) Leafy Berkshire – Our Mr. Badman spent time renovating his house and developing two, rather exciting new projects. -Keith caught up again with old, long-time mate, Danny during the evening of 15 April. -Leafy Berkshire – Keith continued work on his Dave Cash project. (11) Aintree, Liverpool / twinned with Berkshire – Keith’s winning streak, in the world’s greatest horse race, The Grand National, continued when his picks, Many Clouds and Shutthefrontdoor finished first and fifth respectively. (7) Leafy Berkshire – That time again. Keith was back on Record Collector / Rockin’ The Box duties today when he started preparing his latest article, a piece on the 1968 LWT / ITV musical revue, Jacques Brel is Alive and Well and Living in Paris. -Meanwhile on Amazon Canada, just one copy of Keith’s Marilyn (paperback edition) remained in stock. Incredible! “Three years after its release in the fine country and it’s still selling!” As of today, the softback version stood at #11 in the “Books > Biographies & Memoirs > People, A-Z > ( M ) > Monroe, Marilyn” section of the site. (6) IMDB/ the world – Our Mr. Badman was placed at No.24 in the “Most Famous People Born in Slough” listing on the world-famous IMDB site. (4) UK / Europe – The 2012 documentary, Freddie Mercury – The Great Pretender (extended Director’s Cut), which featured Keith in the role as archive researcher, was repeated on BBC Four late this evening. (3) Canada – The run continues. Keith’s Marilyn (paperback edition) was placed at #9 in the “Biographies & Memoirs > People, A-Z > ( M ) > Monroe, Marilyn” section on Amazon Canada. (2) Leafy Berkshire – Another project began when Keith held a lengthy conversation with the legendary, 60s/70s pirate, BBC and Capital Radio DJ, Dave Cash. (31) Canada – On the rise again! On Amazon Canada, the paperback edition of Marilyn climbed back to the #9 position in the “Biographies & Memoirs > People, A-Z > ( M ) > Monroe, Marilyn” and the #72 slot in the in the “Humour & Entertainment > Movies > Biographies” sections of the site. (30) Leafy Berkshire – Despite it being given the go-ahead, Keith still continued to fine-tune the archive aspect on the forthcoming David Essex movie. He also spent part of the day compiling info for the recently started Dave Cash project. A plan to speak to the legendary Pirate/ BBC and Capital Radio DJ, in a few days time, was also formulated. (26) USA – Still selling! Just one copy of Marilyn (paperback edition) was in stock on Amazon.com. -Later that evening, Keith spent the night catching-up with his old mate, Daniel J. Wall. (22) IMDB / World – The run continued. Keith was placed at No.25 in the “Most Popular People in Slough” category on the highly influential, worldwide film/TV database, IMDB. (21) South London – Keith travelled into London to celebrate his ol’ mate, Tel’s birthday. A lovely (wine-fuelled) evening was had by all. (16) South West London – Keith journeyed out to Wandsworth to meet with Alan G. Parker for further, post-production work on the David Essex movie. Another screening of the final cut of the 98-minute production also took place. - Italy – The Kindle version of Keith’s Marilyn climbed back up to the n.14 positon in the “eBook Kindle > Arte, cinema e fotografia > Cinema e television” section of Amazon Italy. (15) Leafy Berkshire – Mother’s Day again and Keith spent the duration of it with his dear Mum, Kathleen who is, without doubt, the greatest one in the entire history of the world!! (10-12) South Coast – Keith made a return trip to “Peter Lawford-land” on the South Coast. In addition to tending to his palm tree, and breathing in the beautiful sea air, a most pleasant two-day stay was had by all. (3-4) Leafy Berkshire – Yep, that time again. Keith compiled his latest piece for Record Collector magazine. This month, a full-page tribute to the New Romantics leader, Steve Strange who recently passed away. The piece in question focused on his 1981 appearance on the LWT/ITV Danny Baker series, 20th Century Box. (30) West London – Keith travelled to Hammersmith, West London to catch-up with his old pal, the comedy and Queen DVD / Blu-ray producer, Simon Lupton. A number of rather exciting, forthcoming projects were once more discussed and plans were formulated. Once again, more news soon! (27) South East London – Keith began three days of highly important film/TV meetings by travelling out to Surrey Quays to meet Rob Caiger, the music producer and consultant on bands and projects such as the Small Faces, ELO, The Move, The Faces, The Drifters etc. etc. etc. A number of rather exciting projects were discussed. More news soon! (21) Leafy Berkshire – Besides having a lengthy conversation with the noted film director, Alan G. Parker, Keith also continued with some additional fine-tuning to his contribution to the forthcoming, rather exhaustive, Hunter Davies Beatles Encyclopaedia, which is set for release in mid-2016. -Meanwhile, also today, our Mr. Badman climbed to the no.16 position in the “Most Popular People Born In Slough/ England/ UK” chart on IMDB. Sill in the top spot; the popular singer/ actor/ entertainer, Tracey Ullman. (17) Leafy Berkshire – “You gotta pay your dues, if you wanna sung the blues.” Keith filed and submitted his annual HMRC tax returns…and he was happy to do so. -The Italian Kindle version of Marilyn was still sitting pretty on Amazon Canada; n.24 in the “eBook Kindle > Arte, cinema e fotografia > Cinema e television” section of the site. (14) Leafy Berkshire – Just when it looked to be done and dusted, Keith carried-out some extra, ultra-fine-tuning on the forthcoming, rather exciting, Hunter Davies/ Beatles Book project. - UK TV / Europe - Later that night, at 10pm UK time, BBC2 transmitted (for the first time in the United Kingdom) the 2-hour documentary, The Dave Clark Five... And Beyond which featured Keith's two, 2001 interviews with the group's lead singer, the wonderful, late great, Mike Smith. (10) UK –Keith once again found himself in the no.24 position in the “Most popular people born in Slough” category on the world-famous IMDB site. (8/13) Leafy Berkshire – Time for another Rockin’ The Box piece for Record Collector magazine. This time, a tribute to the legendary Blues singer, Joe Cocker, who sadly passed away on December 22 last year. The show in question? The short-lived, January 1993, Music Box/ Yorkshire ITV programme, Musical Routes. (7) Canada – Marilyn continued to make the news when the hardcover version of it climbed back up to the #16 position in the “Biographies & Memoirs > People, A-Z > ( M ) > Monroe, Marilyn” section of (good ol’) Amazon Canada. (6) Italy – A cracking day on Amazon Italy when (after a four-month gap) Marilyn returned to the n.4 position in the “Kindle Store > eBook Kindle > Arte, cinema e fotografia > Cinema e television” listings as well as the n.45 spot in the “Libri > Arte, musica e cinema > Cinema e television” and n.85 in the “Kindle Store > eBook Kindle > Biografie, diari e memorie > Biografie e autobiografie” sections of the site. (5) Canada – Readers on that site push Marilyn (hardback edition) back up to the #12 position in the “Biographies & Memoirs > People, A-Z > ( M ) > Monroe, Marilyn” section. (1) UK – A very Happy New Year to everyone! And what a great start when Kindle reader, Mrs. H. Macdonald of Scotland posted a five-star review of Keith’s Marilyn book on Amazon.co.uk. “Everything i expected it to be,” she wrote. The photo page has been updated. Click here to see. December 2014 "Everywhere it's Christmas..."
(29) Canada / Italy – All go on Amazon where, in Canada Keith’s Marilyn (hardback version) was once more seen climbing up the listings on three separate charts; at #6 in the “Biographies & Memoirs > People, A-Z > ( M ) > Monroe, Marilyn,” #44 in the “Humour & Entertainment > Movies > Biographies” and at #64 in the “Humour & Entertainment > Movies > History & Criticism” sections of the site. “Not bad aye, for a book which first appeared in the country over two years ago,” Keith remarked. While on Amazon Italy, the Kindle version of Marilyn climbed back up to the n.47 position in the “Arte, cinema e fotografia > Cinema e television” section of the site. (26) Boxing Day – During a return visit to Oxford House, Keith discovered he had reached the no.23 position in the “Most popular people born in Slough” category on the world-famous IMDB site. (23) Canada – On Amazon Canada, the paperback version of Keith’s Marilyn was at #17 in the “Biographies & Memoirs > People, A-Z > ( M ) > Monroe, Marilyn,” while the hardcover version of it stood at #55 in the “Biographies & Memoirs > People, A-Z > ( M ) > Monroe, Marilyn” sections of the site. (20) Leafy Berkshire – Yes, it was time again. Keith made a welcome return to the fine, upstanding establishment, The Barratt Bistro, for another evening of fine food and delightful conversation. The Gallus gallus domesticus served that night was, in all probability, the best ever. “I thought I’d give chicken a try for once,” our Mr Badman said afterwards, "and I'm mighty glad I did." (19) USA / Canada – Impressive Christmas sales meant that just one copy of Marilyn (paperback edition) remained in stock at Amazon.com and just two copies of that version were at Amazon Canada. (17) North / West End London – A trip round to The Emirates, home of the world’s greatest-ever football team, Arsenal FC, and then to The Sanctum, in Soho for A Geezer & A Blonde’s annual Christmas get-together. Joining him that night, the entire crew of The David Essex Story. (16) Leafy Berkshire – With Christmas fast approaching, Keith resumed archive research resumed on The David Essex Story. (14/15) UK – An unique event when BBC Four broadcast, for two straight nights, three programmes on which Keith received archival credits on. 2011’s Award Nominated, Queen: Days Of Our Lives (on December 14) and 2012’s The Who's Quadrophenia: Can You See The Real Me? (one night later, on the 15th). -Leafy Berkshire – Another busy day of archive research on the David Essex project. (10) London – Twickenham Film Studios, St. Margaret’s. Keith spent the day at the legendary movie studio for a meeting with director, Alan G. Parker and a first view of the editing on the new documentary, The David Essex Story. (8/9) Leafy Berkshire – Keith completed his Record Collector Rockin’ The Box tribute to the Small Faces / Faces keyboards legend, Ian McLagan with a piece about the Small Faces’ 1967 two-track, live appearance on the ATV / ITV variety programme, Piccadilly Palace (US title) / Morecambe & Wise Show (UK). -Leafy Berkshire – Further archive research on the new film, The David Essex Story. (7) Amazon.co.uk – thanks to “E.c” for his 5-star review of Marilyn (Kindle edition) on the site. “Wow,” he wrote. “Well written. Nice to hear the truth. It should have come out years ago.” Thanks E.c.!! (5) London/ Leafy Berkshire – Keith’s 2014 Birthday Tour began in South London, with Terry and Fiona and continued back in Leafy Slough, with some more old mates, Dave, Spencer, Brian, Cheryl and Pat. Thank you everyone! (4) Texas, USA – Sad news swept the globe that the renowned Small Faces / Faces keyboardist, Ian McLagan had died, aged 69. Keith first met the legendary musician back in 1997, at the time when his book on The Small Faces, Quite Naturally was released. Pleased to say, he loved it. McLagan managed that rarest of things: to be in two truly great rock’n’roll bands. He will be sorely missed, for sure. (2) UK / Europe – The latest edition of Record Collector, featuring Keith’s piece on the 1978 edition of The South Bank Show, starring Patti Smith and Carl Perkins, came crashing the letter boxes of subscribers across the country.